I had to submit an extensive academic assignment in my college last week and the deadline was very short. 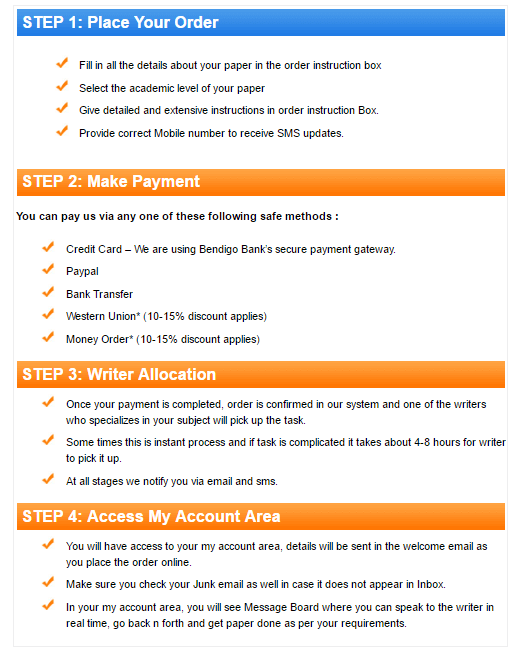 So, I decided to take help of an academic writing service provider online. I logged into AcademicWriting.com.au for availing the service of academic writing. Here is my review on their services. 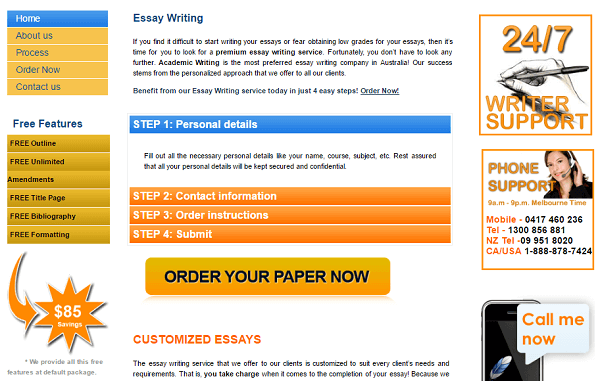 I was looking for an online assignment writing service provider and I came across AcademicWriting.com.au. The background of the company says that the business is based out of Melbourne in Australia. This academic writing service provider works with the motto of helping the stressed-out students to complete their assignments fast. The reason I chose AcademicWriting website to opt for its services is that they offer sample writings and blogs in their website. I was confused by equation I had to solve while entering my personal information, but it gave off a secure feeling. After I processed to the order page, I almost had a heart attack from a woman suddenly appearing in the left bottom corner. I don’t mind the ads, but I couldn’t close the ad at all. They should at least add a close button, since that picture is too annoying. The price seemed to be on the higher side when compared to similar academic writing service providers available in the web. 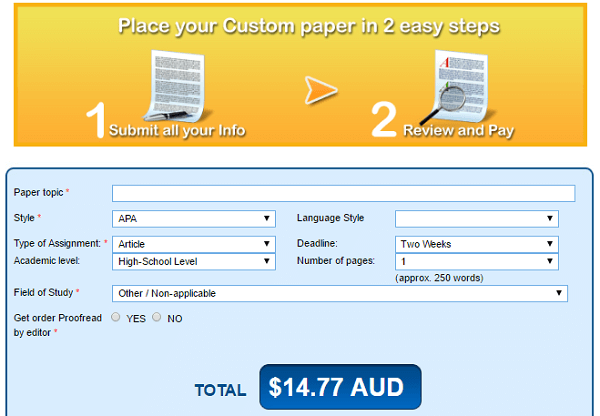 The amount charged for the academic writing services is $14.77 AUD per page which contains an approximate of 250 words. In addition to that, no discounts are offered! As a first-time customer, I expected at least some small amount off as a welcoming bonus, but there weren’t any. In order to book a requisition, I clicked on the “Order Now” page at AcademicWriting.com.au and filled up all the necessary details which are being asked. Also, I filled up my contact details so the customer support team can get in touch with me once the ordered assignment is ready. I then picked up my deadline and my expectation on the quality parameters. After filling all the details in the “Order Now” form, I was charged a price, which is a little higher than the optimum. The good part is that I had the opportunity to work with the essay writer who was working on my assignment. She held a post-graduate degree in social science. AcademicWriting has an option of direct messaging to the customers if the customers are comfortable. I opted for it. But the bad part is that she was supposed to give me the updates of the progress from time to time. I never heard from her first, I was the one to ask for my order status, and the reply was far from a prompt one. There are mixed feedbacks on AcademicWriting.com.au writing delivered to the customers. The list contained happy and satisfied customers as well as not so happy customers. Bad reviews were mostly about how the quality didn’t match the price, and that content was not entirely relevant to the requested subject. The quality of AcademicWriting.com.au essay turned out not to be premium but of low quality. Some of my points of views weren't highlighted and there were some mistakes in references. I chose to believe in the good reviews more, but that was my mistake. All the AcademicWriting writers available to work for me had their credentials showcased online in a great manner. I have chosen the one who seemed to be the best choice for my assignment. Finally, I chose a writer who held a Master’s Degree in Social Sciences. At that time, I believed that would be an aid for my paper, after receiving my order I started to doubt where that degree was acquired from. The overall result was not so satisfactory. The quality of AcademicWriting.com.au essay turned out not to be premium but of low quality. Some of my points of views were not highlighted and there were some mistakes in references. Moreover, my interaction with the writer was much slower than I would expect from a reliable service. I think that this service has a long way to go to meet the stated quality. Essay On Time Writing: The Most Reliable Service You Can Find.